Today I want to write about a really cool and unique bird, the shoebill. These amazing birds grow to up to 150 cm tall. 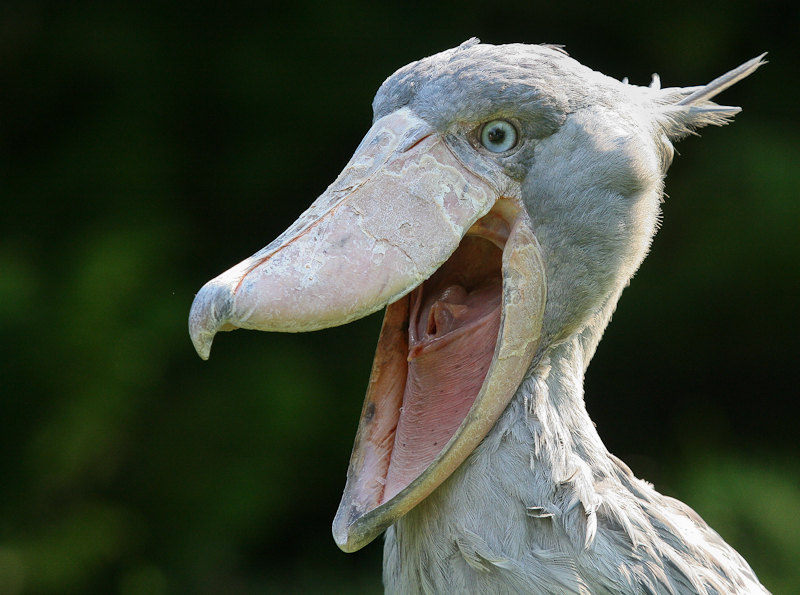 Shoebills get their name from their huge bills that can grow up to 23 cm long. These bills are very powerful and have a sharp hook on the end, helping them to catch their prey. They catch and eat a range of fish, including catfish and lungfish that can grow up to 1 metre long, snakes, frogs, rodents, waterfowl, lizards and baby crocodiles. At breeding time, they lay 1-3 eggs on a massive nest that measures up to 1.7 metres long. When the chicks hatch they are fed by both the mum and dad who regurgitate fish for the babies to eat. Normally only the oldest chick makes it to adulthood. Shoebills are found in swamps throughout South Sudan, Uganda, Kenya, Democratic Republic of Congo, Zambia and Rwanda. They are considered vulnerable to extinction due to loss of habitat and poaching. It is estimated that there are about 8,000 left in the wild. Are there any other interesting facts that you would like to share about shoebills?